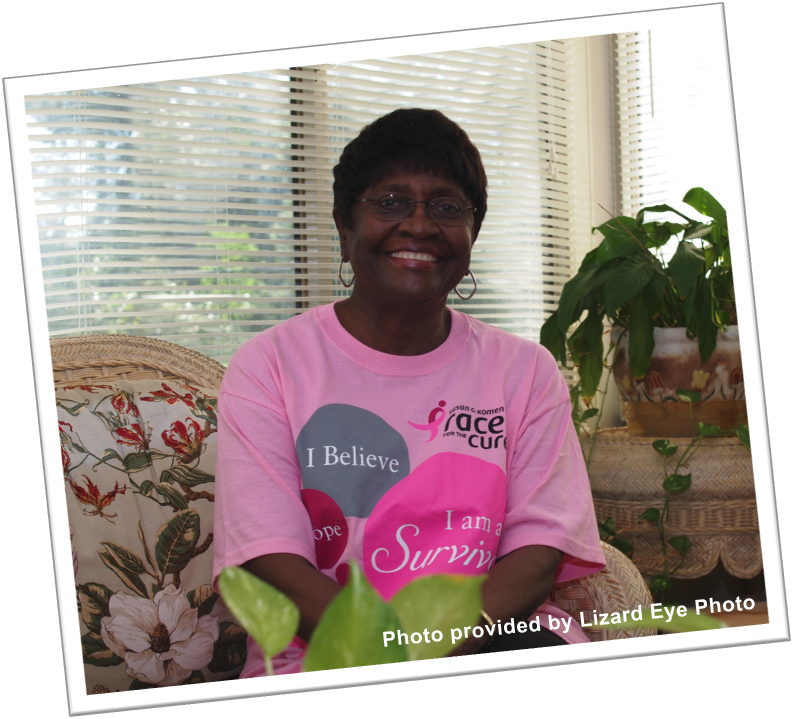 November’s Survivor of the Month, Janie Bruen, was nominated by not one but several people! I had the pleasure of meeting her and her supportive husband in their home when I took her portrait. We chatted for a bit in the sunroom of her Wilmington Island home and she is just as much of a delight as all the other women I’ve met this year! She too, has an equally powerful, strong and at times heart wrenching story to tell. In 2001, she was diagnosed with breast cancer as a result of a routine mammogram. Janie was told that it was too small to be detected with self-examination; that it was small, yet lethal. However, she was extremely blessed because she did not have to have a mastectomy and the lumpectomy was recommended followed with only radiation and five years of the prescriptive drug Tamoxifen. “While receiving the six-weeks of radiation, I was able to care for my 36-year old son who was terminally ill who subsequently died the day after I finished radiation treatments. I never told him of my condition. Yearly mammograms since this time have been “normal”. She hasn’t been able to participate in the 5K walks or events, but has contributed financially to the cause. Another Survivor of the Month, namely, Carolyn Stanley and also Laquinta Larry have walked in her honor. “It is heart –rendering to know that there are organizations who are engaged in efforts to wipe out/find a cure for breast and other forms of cancer,” Janie says. She does what she can to be an advocate for other women. “I have talked with friends who have been diagnosed with breast cancer and encouraged them through their treatment periods and follow-up. Currently, I am recuperating from a bone marrow transplant as a result of being diagnosed with multiple myeloma in March 2011. The transplant was done on August 9, 2011. As a survivor of two types of cancer and being truly blessed with God’s favor, I have a stronger desire to help other through organizations such as the Susan G. Komen for the Cure, through volunteering my time once I have fully recuperated because God has blessed me abundantly. For this and more, I give Him all the praise and glory. I MUST give back to others.” she says of her advocacy. Due to her bone marrow transplant, we weren’t able to go outside of her home for her portrait, but she was feeling great that day and beamed positivity and radiance nonetheless.